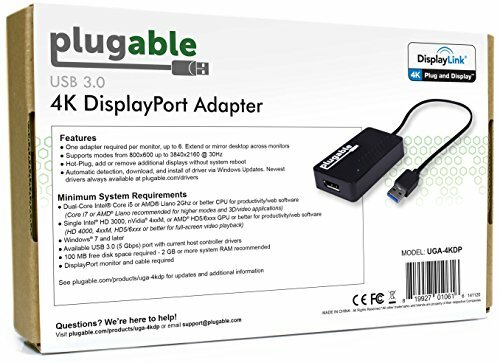 Featuring the highest-performance DisplayLink DL-5500 chipset, the Plugable UGA-4KDP graphics adapter lets you connect an additional DisplayPort display up to 3840×[email protected] (4K/UHD/2160p) to your Windows-based laptop, desktop, or tablet via USB 3.0. Drivers available for Windows 10/8.1/7. 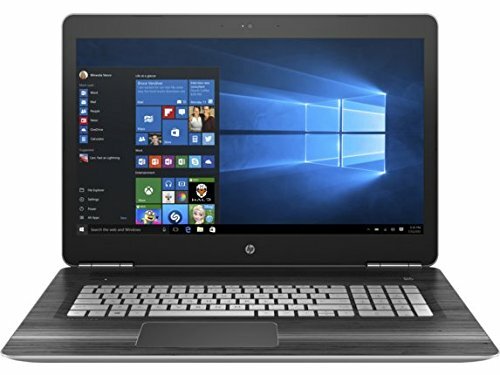 Intel i5 or AMD A8 2GHz or better CPU recommended for productivity/web software at 4K. Single Intel HD 4000, AMD HD 7xxx, NVIDIA 5xxM or better recommended for productivity/web software. 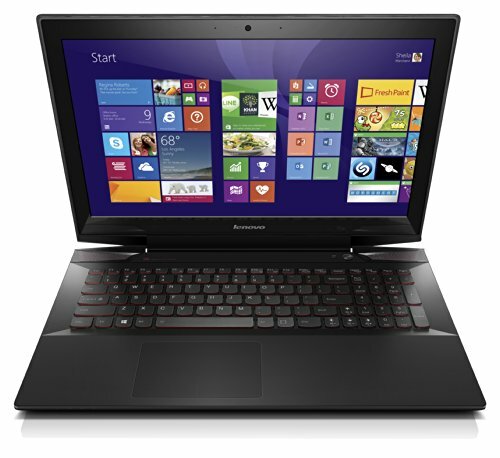 Intel i7 2+GHz and HD 4000/AMD 8650/Nvidia 7xxM for full-screen video playback. 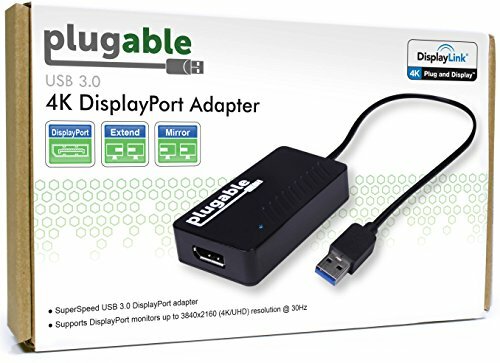 Supports DisplayPort displays up to 3840×2160/4K. 3840×2160 mode has a refresh rate of 30Hz, while 3440×1440 supports 50Hz. 2560×1600, 2560×1440, 2560×1080, 1920×1080 (1080P) and lower modes refresh at 60Hz. 4K/UHD output requires compatible 4K/UHD display. Audio outputs in stereo format; 5.1 output not supported. 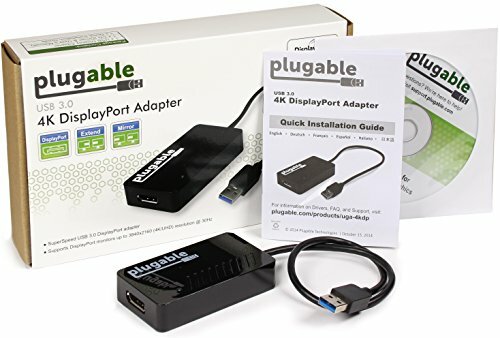 If connecting a 4K HDMI display, an HDMI 1.4 “active” adapter such as the “Plugable DP-HDMI” must be used. Passive adapters and all DVI adapters will limit output to 2048×1152. 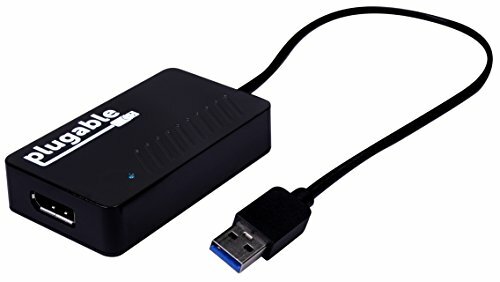 Dual-link DVI monitors (Qnix, Yamakasi) not supported. Supports Windows 10/8.1/7. Surface RT, Mac OS X, and Linux/Unix are not supported. 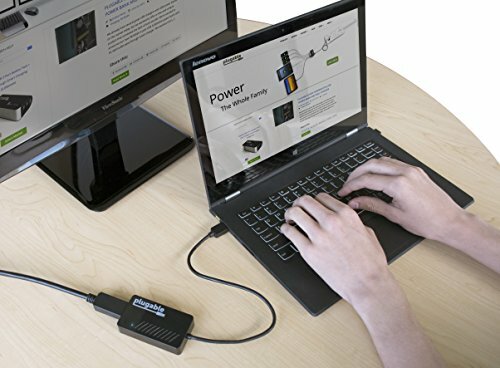 Does not support DisplayPort MST nor conversion to Dual-Link DVI. Suggested for use with web/productivity software; not recommended for HD video playback or high end graphics work. Gaming and playback of HDCP protected content not supported.